He's marvellous. One of the French and American singers but I think he was French, not so American. He was the best. You right about that, also very intelligent. He can sing in Spanish, and he did it very well. He sung in German, too. e. g. "Es gibt Mädchen so zum Lieben" and "Das sind zwei linke Schuh"! Il a chanté en Allemand, aussi. Par example "Es gibt Mädchen so zum Lieben" et "Das sind zwei linke Schuh". Indian Summer the best romantic song ever, be it sung in French or English. Why oh why is it not on English Radio 2 on Sunday mornings at (9am+ with Steve Wright) God only knows, but then his idea of a romantic song leaves little to be desired. Enough said. 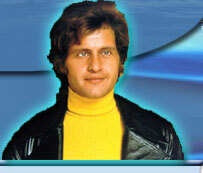 There is only ONE JOE DASSIN, and I love him !!! TE AMO JOE DASSIN, POR SIEMPRE. ERAS BELLO, SEDUCTOR, INTELIGENTE! Still have him in my heart.